Well, my son starts back to school next week and with that comes school supplies, school clothing and lots of chasing around again! None of them I am looking forward to but at least I have some help this year! My son and daughter got some super cute and amazing clothes from French Toast, a leader in children's clothing for kids of all ages! A classic black dress shoes is a must for all the school programs, to accessorize with dresses and for church! 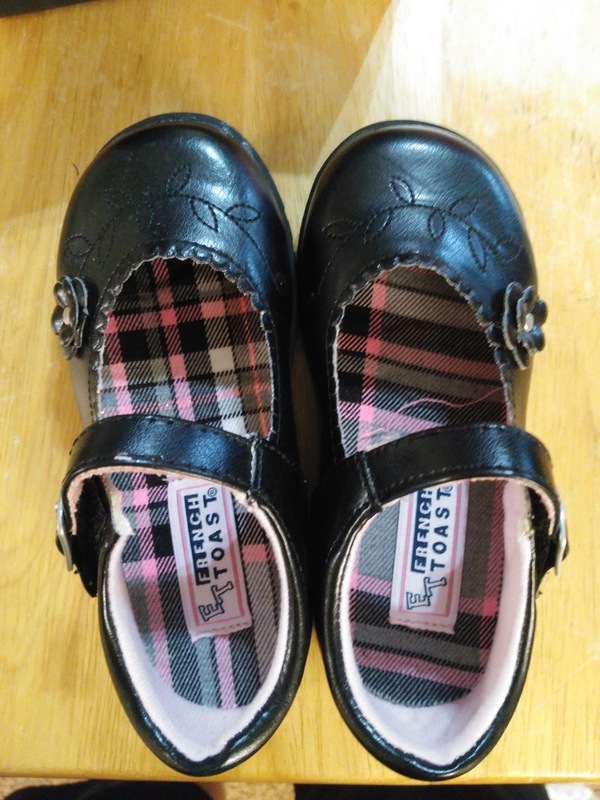 These classic Mary Jane style shoes for toddlers are as comfortable as they are adorable! The padded footbed offers ultimate comfort and they are easy to put on with the easy adjustable strap. Plus, they can even where them running around because they have a non-marking sole! My son is not big into dressing up! He would rather be in a pair of shorts and t-shirt running around! But with this crisp dress shirt with a comfy expandable collar for extra breathing space throughout the day, he will at least be comfortable and super handsome! I LOVE the Wrinkle No More™ fabric for easy care and the 50 wash tested for comfort that lasts. And the expandable collar will be great for growing with my son! The collar and tag-free design will keep him comfortable all day long! Every little boy needs a blazer! This Blazer is so versatile and handsome! It is perfect for school programs, church and weddings! The preppy style is made easy with this gold-button blazer that will keep him looking sharp no matter what the dress code. As I mentioned, my son isn't big into dressing up but he does like wearing polos when he does need to dress up a little bit! This polo is perfect for him because this tech fabric polo with side vents absorbs sweat quickly so he can stay cool for school and it is super soft and comfortable! Plus, the blue is beautiful and will look great with many different color pants! So whether your child wears uniforms to school or just needs some new clothes in their school wardrobe this year, French Toast is the place to shop! They have it all and all the clothes are made with active children in mind! They will be comfortable and looking sharp in French Toast clothing! You can purchase all French Toast clothing from their website.